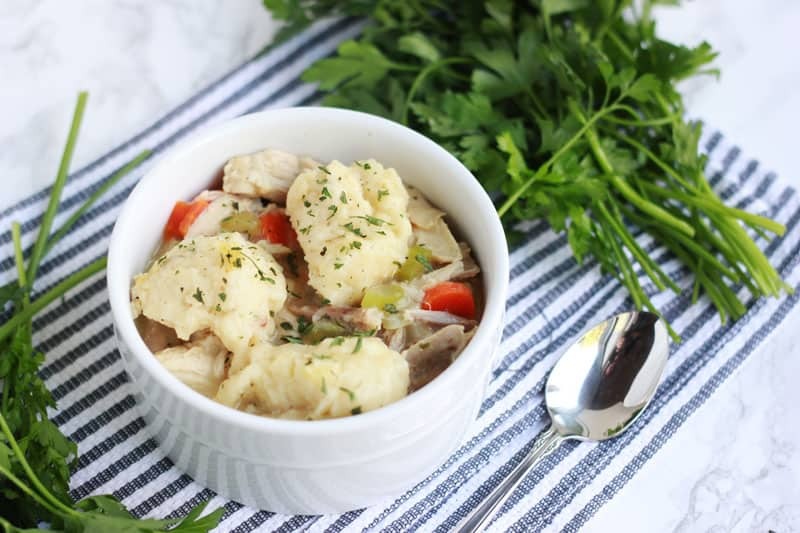 Chicken and Dumplings is a fall staple and the best way to warm your belly on those colder nights. It’s comfort food season and I’m on the hunt for some good ol’ staples. 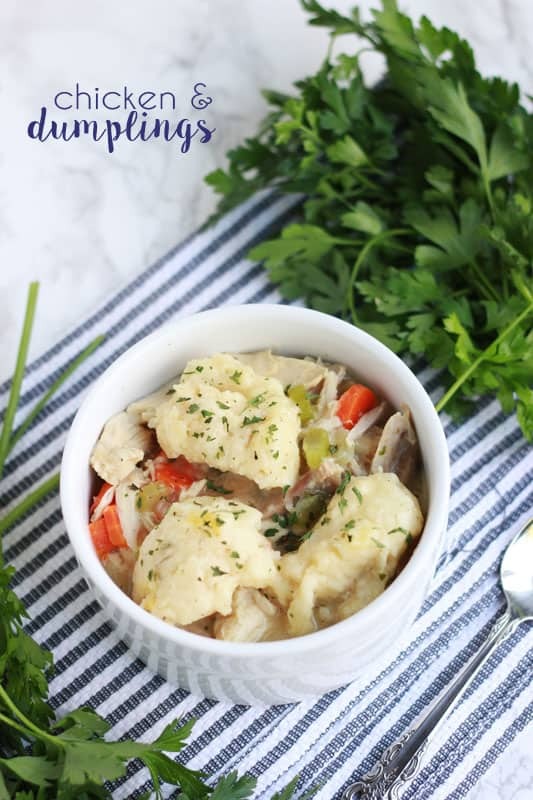 Chicken and dumplings has been on my recipe bucket list for a while now and I am so so so glad that I finally got the chance to make it. 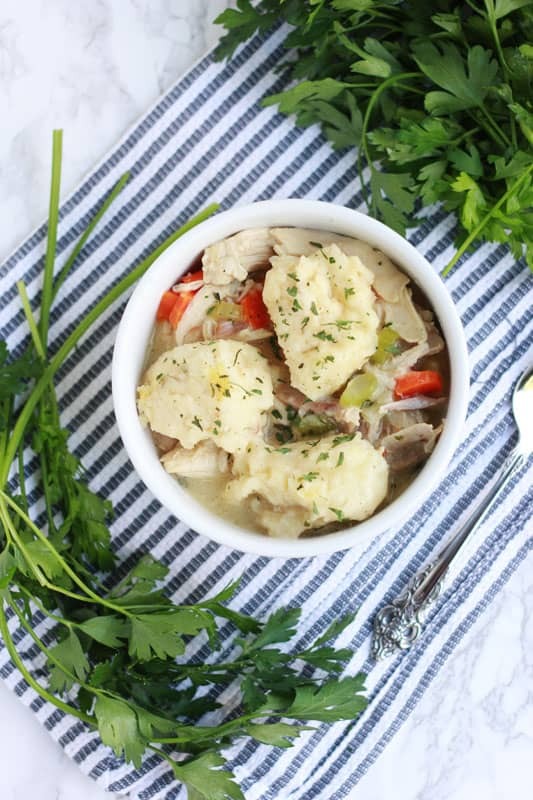 The classic combination of chicken soup topped with a quick and flavorful biscuit is exactly the kind of dinner we needed in our go-to stash. I found the original version on food.com but after a few tweaks and changes we were left with a bowl of fall magic. Even my picky six year old gave this two thumbs way up which is saying something. The original recipe called for raw chicken and a crazy long cooking time. To cut back on all of that waiting I substituted a rotisserie chicken (thank you Harmons!) and added in a little chicken base for an extra punch of flavor. All together it took about 10 minutes to get things started and only 40 minutes of cook time compared to the original 3 hours (yikes!). That means dinner was on the table in less than an hour and my hungry bunch had happy bellies in a snap! Stir together your chicken, celery, carrots, onion, chicken broth, water, parsley, chicken base, 1 teaspoon salt, and pepper in a large pot. Add more water if not completely covered. Bring to a boil. Reduce heat and simmer for 15 minutes or until the vegetables are tender. While that is cooking combine the flour, baking powder, 1/2 teaspoon salt, Italian seasoning, milk, and oil. When the vegetables or tender drop your dough by heaping spoon fulls on top of your soup. Cover and simmer an additional 20 minutes or until the dough is cooked through. Thanks! 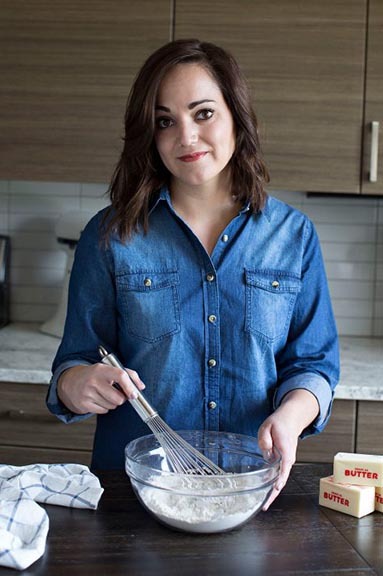 It really is the perfect fall comfort food.